YOUR MAMAS NOTES: Your Mama had planned to spend the morning discussing the Hollywood Hills home of a gender-bending fashion critic, the Sunset Strip residence of a wildly successful writer/producer or maybe taking a peep at the pristine Parisian hôtel particular of a rapacious collector of the haute couture. We also considered delving into the rumors and recent reports that frozen faced Oscar winning Aussie actress Nicole Kidman and her country crooning and hair frosting and flat ironing huzband Keith Urban are considering snatching up in a $10,000,000+ river front residence in a particularly posh part of Sydney, Australia where their nearest neighbors would include Oscar winning thespian Cate Blanchett and her playwright man-mate Andrew Upton. 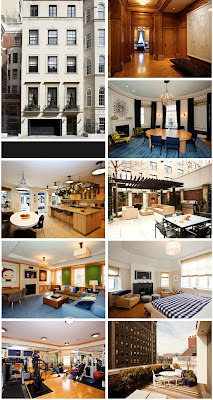 The delicious morsel we decided to discuss, a townhouse just off Fifth Avenue on the Upper East Side, belongs to music mogul Lyor Cohen who recently listed his fully rehabbed and completely re-did historic house with a very 21st century asking price of $28,000,000. Mister Cohen, currently the CEO of Recorded Music as the Warner Music Group, was once the right hand man of hip hop impresario Russell Simmons whose Def Jam label was it back in the late eighties and early 1990s. Together they signed and promoted legends like Public Enemy, LL Cool J, Beastie Boys, Patti Labelle and trouble making rapper Foxy Brown (nee Inga Fung Marchand). Misters Simmons and Cohen cashed out of Def Jam Recordings in 1999, a move that reportedly made Mister Cohen more than $100,000,000. Presumably Mister Simmons came out of the deal with even more moolah in his already bulging bank accounts. Anyhoo, Mister Cohen stayed on at Def Jam as CEO until 2004 when he moved over to run Warner Music where he oversees a bazillon big and not so big name artists including Madonna, Björk, Billy Bragg, k.d. lang, The Magnetic Fields, Green Day and P-Diddy (or Diddle Daddle or Daddy Puff or whatever damn thing he calls himself nowadays). Mister Cohen, a dee-vorcee with a coupe of kiddies, currently dates fashion designer and social fixture Tory Burch. Miz Burch, also a dee-vorcee with a couple of kiddies, happens to own and occupy a massive, approximately 9,000 square foot Daniel Romualdez designed spread at The Pierre that meets if not exceeds the modern opulence of Mister Cohen's townhouse. Property records show that Mister Cohen bought his historic townhouse in November of 1999 paying $9,175,000 for the limestone mansion. Listing information indicates the house was built in 1892 but the now elegant and austere façade was re-designed in 1921 by high class architect Cass Gilbert who occupied the house in the early decades of the the 20th century. Mister Gilbert, for those not familiar with the architectural history and lexicon of turn of the century New York City, was a pioneer of the sky scraper and is the man responsible for–among other buildings–the outrageously gorgeous and intricately articulated Neo-Gothic style Woolworth Building in lower Manhattan. Although square footage information is not included with the listing, Your Mama pressed our trusty ruler and beloved and bejeweled abacus into action to determine that, based on the measurements shown on the floor plan, Mister Cohen's mansion measures right around 8,000 square feet, not including the basement. Listing information states there are six bedrooms and 7 full and 2 half poopers. However, when Your Mama scans the floor plan we count five bedrooms plus two additional rooms–a family room on the third floor and a home fitness center on the fourth–that could be pressed into use as bedrooms number six and seven if the owner so desired. We also come up with a slightly different pooper count. 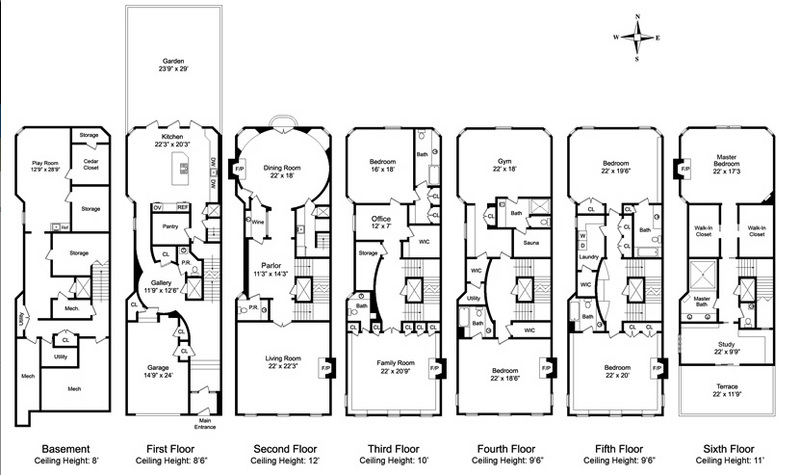 According to the floor plan we tally up 6 full and 3 half poopers for a total of 9 terlits. Anyhoo, after buying the townhouse in 1999, Mister Cohen spent years and, we imagine, millions giving the place a full face lift and children, what a face lift it is. You know how sometimes women get work done on their faces and they just look like older ladees with too much and not very good plastic surgery–you beehawtchas know who you are–and then there are the women like Sofia Loren and Catherine Deneuve who look nearly flawless well into their senior years due the handiwork of very skilled surgeons? Well, that's what's happened here chickadees, this townhouse is like a Sofia Loren or Catherine Deneuve. It retains much of the history, charm and detail that never lets you forget it's a 100+ year old townhouse but it's fitted with all modern amenities. Let's have a quick run down of the numbers: The house is 25-feet wide (22-feet on the interior), spans 7 full floors all serviced by a an elevator, contains 5-7 bedrooms depending on how you count, 9 terlits in 6 full and 3 half poopers (or 7 full and 2 half poopers according to listing information), 6 working fireplaces, at least 28 closets and storage rooms, a garden at the back and a terrace at the top that has views of Central Park, and last but not least, a single car garage with direct access to the interior. Now that, celery sticks, is a rare and lovely luxury in Manhattan. The townhouse is equipped, according to previous reports, with a state of the art electronics and security system that, in addition to a 61-inch plasma monitor plus six more smaller ones, includes a center-channel speaker–whatever that is–that descends from the ceiling at the touch of a button, a high-def satellite dish on the roof that will pull in more than 500 channels, a digital video recorder connected to a T1 line, both interior and exterior security cameras and a video conferencing system that is "one-half Pentagon teleconferencing network, one-half MTV." We do not know what smart architect is responsible for reconfiguring and/or refining the interior layout of Mister Cohen's townhouse, but whomever it is successfully achieved a smooth flow using a rigorous program of well placed poopers, generously proportioned rooms, heaps and loads of closets and storage space right where you need them, ceiling heights of 9.5 to 12 feet on the 2nd through 6th floors and immaculately and meticulously aligned doorways on the upper floors that allow light to penetrate deep into the interior core that contains the wonderfully wide staircase that wraps around the elevator shaft. Another set up Your Mama would like the children to take note of is the kitchen. Despite the precarious looking pot rack, the kitchen is well equipped with a heavenly walk-in pantry, double dishwashers, a wide work island with breakfast counter, trio of glass doors that open to the back yard, dumb waiter for lifting food to the dining room on the second floor and a (possibly dangerously steep) back staircase that connects the kitchen to a butler's pantry off the dining room. 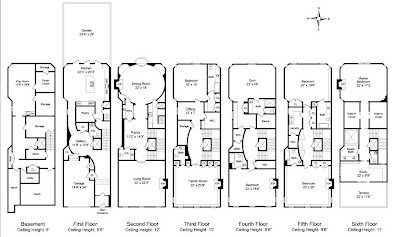 One beef with the layout might be up in the master bedrooms where, technically, one must pass through public space in order to get from the boo-dwar and twin-set of walk-in closets to the master pooper, which is divided into two areas on opposite sides of the hall. We don't mind the separation. In fact, we like the separation. Who wants to brush one's chompers while their wife or huzband is terliting themselves? However, we'd like this suite much better iffin there was a way to close off the entire floor to the lower floors thus providing the sort of privacy Your Mama would require in a $28,000,000 townhouse. Even still, but for some of the day-core and that deeply upsetting Pontiac sized pot rack that threatens to pull the damn ceiling down, there really is little here that Your Mama would change or can beef on about. Let's get real chickens. What sort of piss and vinegar could one possibly muster over that oval dining room with its watery and striated blue rug? (May Your Mama have those olive green tufted chairs that flank the fireplace, please?) Another high note for Your Mama would be the parlor landing on the second floor. We're all goose bumpy over the delicious and manly caramel colored paneling and velvety herringbone patterned hardwood floors that have been paired with the low, modern(ist) black leather bench and the spare painting of a superhero done in a severely restricted palette of black dots on a white background. (Maybe it's a drawing? Anyone recognize this or know the artist?). Seriously people, this may not be the picture of your dream house, but as far as Your Mama is concerned it's insanely and supremely sophisticated in an urban and "I'm not trying to look like I was done by a nice, gay decorator but I was, in fact, did up by a very expensive and nice, gay decorator" sort of way. 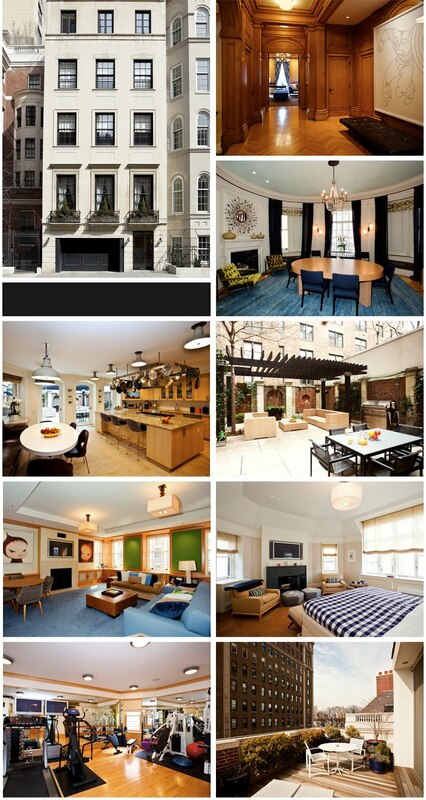 It's unfathomable why Mister Cohen might want to sell this townhouse after spending so much time and energy renovating it, but it might have something to do with the many millions of bucks he's likely to pocket if he and his real estate people manage to find someone to cough up anywhere near his asking price. Previous reports indicate that although Mister Cohen already owns a 6 bedroom and 8 pooper property in super swish Bridgehampton, NY, that he had been shopping around for around $9,500,000 it was widely reported in June of 2008 that he spent $6,800,000 to purchase a waterfront residence on 2.5 acres in the North Haven area of the Hamptons that he planned to knock down in order to build a better version of his vision of a Hamptons hideaway. ooooh child, it has a garage! Madge should have waited. Right off 5th is where y'all want to be! Madge is so far east she could grow tea (Dorothy Parker) Have a wunnerful weekend, Mama. Be careful in them thar hills! wow. all that money and such a beautiful house, and he had to go and buy zuomodern furniture for the "garden". amazing. The circular dining room is pretty interesting. I expected to see a music studio! I ran into Lyor at the old Tower Records on Sunset Blvd about 4 years ago... said hello and he was nice... very prompt and business-like as expected. Like the pad! I don't care for any of the lighting fixtures in any of the rooms.. just my 2 cents..
Gorgeous house! Ah, to be a gazillionaire! But to Tater Tot, this would not be for Madonna. U see the garden and all those windows looking down to it and to the rest of the property? A Madonna deal breaker, I'd guess. And even if she's too far east, it doesn't matter. She's Madonna! WHEREVER she is is the place to be. Oh, my Gosh, Tater Tot, you're absolutely right...I should have waited for that pad to take over the realty market !! What was i thinking when i bought the East 81 st townhouse ?!? But you know what ? I'm a mega rich millionaire and i think i'm gonna buy that pad as well...so Jesus could be the right side of the park just like me !! can i get me a little commission check there, Madge? how about some free CD's? Man that elevator must get a workout! Based on a 17 Dec 00 Observer article, it sounds like this house must have been remodeled and occupied by Cass Gilbert, Jr (who was also an architect), as they note that Gilbert moved out of it in 1943 and into an apartment on Park Ave. The elder Mr Gilbert passed away in 1934, so it's unlikely he was downsizing nine years later. It would also explain the pronounced Art Deco flavor of the original renovations to the house (the facade, the oval dining room etc). Lyor Cohen is a beast. I don't care much for this apartment, I don't know which year the house was built but it almost looks new on the inside. Appears they destroyed some of the original architecture (in the ceiling amongt other places) whilst renovating. These are of course things that drag down the value of the apartment. I should have paid more attention in Art, but I believe the superhero art is called Pointillism. Cannot, for the life of me, find who did that piece on Captain America.